Biden China Visit Literally Sees Push Come To Shove In U.S.-Sino Relations : It's All Politics In what may be metaphors for the edgy U.S.-China relationship, two high-profile American visits to Beijing were marred by pushing and in one case actual fighting between representatives of the U.S. and Chinese. One incident involved pushing and shoving between U.S. and Chinese officials at an appearance by Vice President Biden. Vice President Biden and his Chinese counterpart, Xi Jinping, seemed to hit it off in Beijing, not so for other Chinese and Americans. In what may be metaphors for the ever edgier U.S.-China relationship, two high-profile American visits to Beijing were marred by pushing and in one case actual fighting between representatives of the U.S. and Chinese. One incident involved pushing and shoving between U.S. and Chinese officials at an appearance by Vice President Biden who's on an official visit to China partly to reassure officials there about U.S. finances. The other was a serious fight that broke out during to the Georgetown University men's basketball team during, of all things, a goodwill game Thursday. During an event at the Great Hall of the People in Beijing, U.S. reporters and members of the vice president's staff got into a shoving match with Chinese officials while Biden delivered brief remarks nearby. 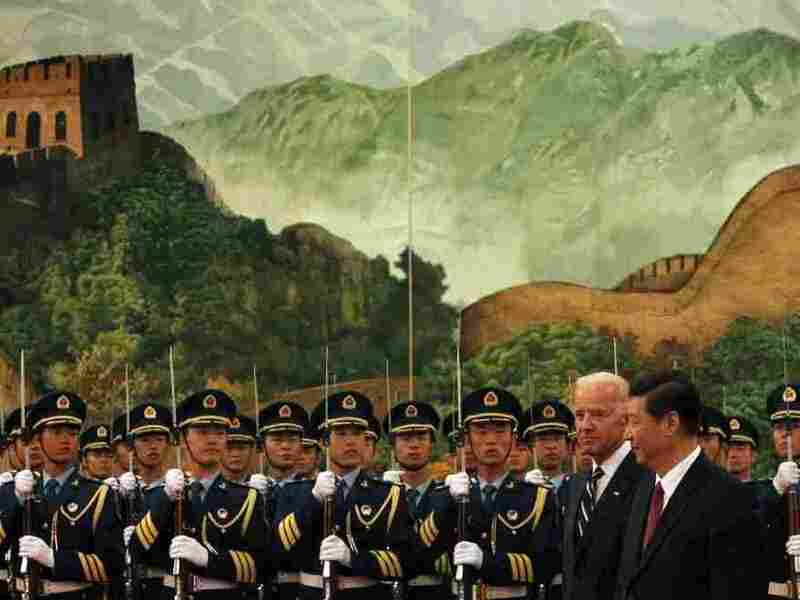 Biden had just received welcoming words from his Chinese counterpart, Vice President Xi Jinping. "It is my fond hope that our personal relationship will continue to grow," Biden said to Xi, who is widely expected to be the next Chinese president. It was right about this time that a near-brawl was breaking out about a hundred feet away from the diplomatic exchanges in the Eastern Hall of the Great Hall of the People. Only minutes into Biden's remarks, Chinese officials had begun to direct reporters toward the exits. Most reporters and the vice president's staff objected, saying it was important to cover the entirety of Biden's opening statement, as had been the agreement between officials beforehand. A Chinese press aide said Biden was going on far too long for their liking. But in fact, including the consecutive translation of his comments from English to Chinese, Biden spoke only two or three minutes longer than Xi had. Soon the stern shooing turned into forceful shoving. As reporters tried to stand their ground, Chinese officials locked arms and pushed forward in a show of overwhelming force. Soon enough Biden did finish, but reporters had difficulty hearing the entire thing because of the fisticuffs. This wasn't the first time Chinese officials got into an altercation with officials in the Obama White House and American reporters. Former White House press secretary Robert Gibbs had to forcefully keep Chinese officials from barring U.S. journalists from a meeting between President Obama and Chinese Premier Wen Jiabiao in Copenhagen in 2009. As if the fracas at the Great Hall weren't bad enough, there was a scary Beijing fight involving other emissaries from the American capital, the Georgetown Hoyas and the Bayi Rockets, again, at what was supposed to be a goodwill game. As the Washington Post reports, the situation got so out of hand, Coach John Thompson III pulled his team off the court before the game's end and the team and its American fans felt they had to wagon train from the arena for safety. The Post story has a photo of Georgetown senior guard Jason Clark on the floor apparently about to be kicked or stomped by someone who appears to be with the Chinese team.